Pigs & Pinot Weekend Charlie Palmer’s 7th Annual Pigs & Pinot Weekend will be held at the Hotel Healdsburg in Healdsburg, California, March 23 and 24, 2012. The event is so popular that weekend full access tickets are only available through a lottery. Understandable since this year’s participating pork authorities include Guy Fieri, Michael Mina, Casey Thompson and Michael White. Lottery submissions are being accepted now through Thursday, January 12, 2012, at www.eventbrite.com/event/2680811379. Pasadena PinotFest The 4th Annual Pasadena PinotFest will be held January 14 through February 11, 2012. Sponsored by Noir Food & Wine for the benefit of Hathaway-Sycamores Child & Family Services. The Kickoff Dinner will feature 5 courses, 5 wineries and 5 chefs with Pinot Noir from Clos Pepe Winery, Hitching Post Winery, Alma Rosa, D’Alfonso-Curran Winery, and Williams Selyem Winery. The Grand Tasting will feature 100 wineries pouring Pinot Noir at the Altadena Country Club. For information and tickets visit www.pasadenapinotfest.com. Pinot Days Southern California The 3rd Annual Pinot Days Southern California Grand Festival Public Tasting will be held at Barker Hangar in Santa Monica on Saturday 28, 2012. Over 125 producers of Pinot Noir will be pouring. A number of ancillary wine tastings at local venues will also be held. Visit www.pinotdays.com for more information and tickets. Good News for Wineries US Wine Market Forecast to 2012 recently noted that the United States wine market is one of the fastest growing markets in the world, both in production and consumption. The market has been fueled by increased wine consumption, online wine purchasing and a growing millennial consumer population that is the future of the United States wine industry. Moreover, the rise in the number of female wine drinkers is fueling the growth of the United States wine industry as well. The United States wine market is expected to reach an approximate value of $33.5 billion with 871 million gallons of wine sales by 2013. The report says that the economic recession had little impact on the United States wine industry, but ask $50 a bottle Pinot Noir producers about this and they have suffered as consumers started buying less amounts of expensive wine, searched for bargains, and fueled the success of flash sale websites. Restaurants' wine sales value declined by 10% as consumers dined out less often. The full US Wine Market Forecast to 2012 is available ($700) at www.marketresearch.com/RNCOS-v3175/Wine-Forecast-2659218. On another front, the Wine Institute of California reported that wine exports from California are set to smash all records in 2011 with a 23% increase in shipments in the first 20 months of the year, boasted by a weak dollar and soaring sales in China (exports have increased by 35% in 2011 through October and now account for about 5% of all exports). California producers believe they can exceed $2 billion dollars worth of wine exports by 2020. Also of interest is a report by The Nielsen Company that table wines priced at $20 and up grew 11.1% in volume in the 52 weeks ending October 15, 2011, and domestic table wines outperformed imports in that period. The fastest growing import was New Zealand wines followed by Argentina. Rhys Vineyards Updated Vintage Chart At Rhys Vineyards all bottlings have recently been revisited and they have updated their vintage chart and drinking recommendations on their website. Generally, their 2004 to 2006 wines are in various stages of maturity, the 2007s and 2008s are largely closed though a couple of 2007s are just beginning to unwind, and the 2009s invite early drinking if you are tempted to try a bottle young. The update drinking recommendations are available at www.rhysvineyards.com/wines/ tasting.php. 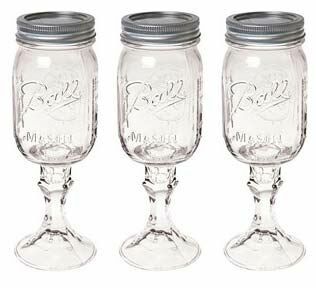 RedNek Wine Glass Carson Home Accents has had sales of $5 million in less than a year since they began offering the RedNek Wine Glass that features a Ball Mason jar glued to a Libbey candlestick holder. The glasses sell for about $11.58 at amazon.com. www.money.cnn.com/2011/12/20/smallbusiness/ rednek_wine_glass/?source=cnn_bin. Book: Great, Grand and Famous Champagnes: Behind the Bubbles This book charts the historical development of Champagne’s high brow brands from its monastic origins and includes chapters on Dom Perignon’s creation of the cork stopper, women behind the bubbles such as Madame Bollinger and the Widow Clicquot, and the story of the great Champagne producers. The high Champagne culture is detailed with stories of monarchical history, political intrigue, tales of art deco age excess, and celebrity dirt. The book contains full color images of great works of art and period ad posters, shots of glamarati past and present, and fascinating historical photos. Written by wine writer Jayne Powell and published by Arbon Publishing, the book is distributed by the Wine Appreciation Guild and is available at bookstores and online. $59.95, hardcover, 240 pp. Veteran Winemaker, Forrest Klaffke, Passes Away I really liked Forrest. He was down-to-earth, had a passion for wine and in particular Pinot Noir, and always smiled during the time I spent with him. When I visited him at Willamette Valley Vineyards after IPNC a few years back, we did a marathon barrel tasting that was memorable and when I left, he plied me with bottles and one of my most treasured possessions, a black tee shirt that read, “It’s Willamette, Damn It!” At the time, Forrest told me he had been treated for throat cancer but it was in remission. Unfortunately, he succumbed to a recurrence during the 2011 harvest. Forrest had been at Willamette Valley Vineyards for 18 years, and led the winemaking team for ten years. He was incredibly dedicated to his craft and I am saddened by his passing. 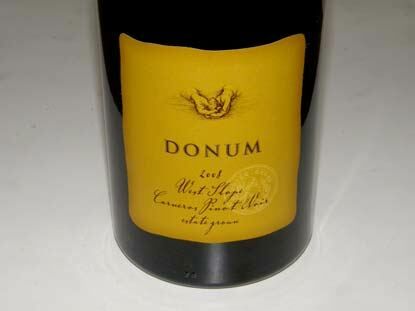 The Donum Estate Sold to Danes Racke, the German wine and spirits group, sold The Donum Estate to Winside, Inc., a partnership of Danish investors, for an undisclosed amount. The deal includes a 147- acre Sonoma Carneros property with 45 acres of vineyards and several buildings, the Donum and Stemmler brands, and inventories. The team that developed The Donum Estate over the past decade will stay in place including Anne Moller-Racke, president and winegrower, Kenneth Juhasz, consulting winemaker, Frieda Guercio, national sales director, and Lauro Servin, vineyard manager. The sale marks the end of 30 years of Racke involvement in Carneros. Anne Moller-Racke arrive in 1981 to help run the German firm’s new acquisition, Buena Vista. As Anne trained in viticulture with industry icons like Andre Tchelistcheff, she was actively involved in forming what is now the Carneros Wine Alliance and establishing Carneros as an AVA. She planted what was then the Tula Vista Ranch in 1989-90 and when Racke sold Buena Vista to Allied Domecq in 2001, it retained Tula Vista, renamed it The Donum Estate and put Anne in charge of making the ultimate Pinot Noir. Wine on Tap Latest Fad Wine on tap has become very popular in restaurants in San Francisco, Los Angeles, Las Vega, Atlanta and New York. The reusable 5-gallon kegs can hold the equivalent of 25 bottles of wine, can store the wine for more than five months, and keep the by-the-glass wines fresher for a longer time. The wines are never exposed to oxygen, making the wines always fresh, and creating zero waste. Winery Ownership and other Changes in Anderson Valley Napa’s Cliff Lede acquired the Breggo label and the Savoy Vineyard, and Twomey bought the Monument Tree Vineyard. Kevin Harvey of Rhys Vineyards now farms the Bearwillow Vineyard located in the deep end of the Anderson Valley, having refurbished this vineyard and added plantings with up to 7,000 vines per acre in density. The new Wendling Vineyard has been planted by noted viticulturist Paul Ardzrooni for Copain and Littorai. Peter Knez acquired Cerise and Demuth vineyards and launched his new Knez label. Maggy Hawk released the inaugural Pinot Noirs from the 2007 vintage this past year. Pinot Noir acreage in Anderson Valley is now up to over 1,450 acres. Fort Ross/Seaview AVA Steve Heimoff reported in his blog and in the Wine Enthsiast on December 15, 2011, that the Fort Ross/Seaview AVA has been approved. The AVA consists of 27,500 acres that is mostly mountainous and above the Sonoma Coast fogline. The new AVA takes legal effect on January 13, 2012. Notable vineyards within the AVA include Fort Ross, Hirsch, Peay and Precious Mountain. 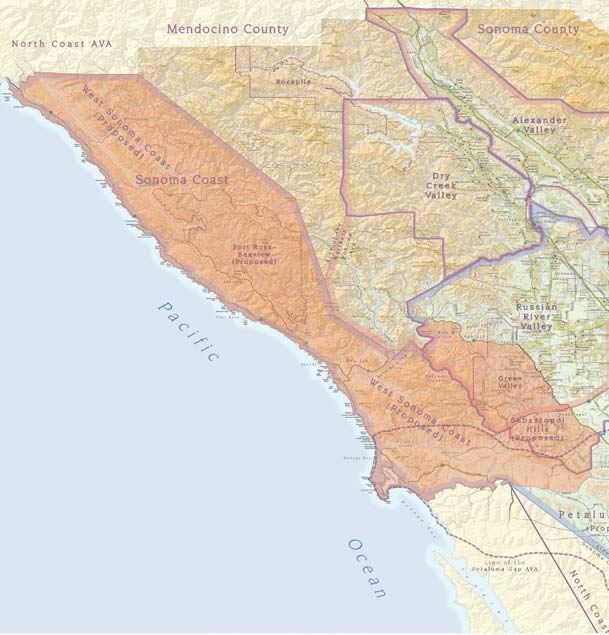 Other sub-regions in the huge Sonoma Coast AVA such as the Petaluma Gap have been reluctant to pursue AVA designation, as the use of the current Sonoma Coast designation sends a powerful marketing message. San Francisco Chronicle Top 100 Wines 2011 For the first time, the winning wines had alcohol levels listed for the wine. The winning Pinot Noirs had a mean of 13.66%. 24 Pinot Noirs made the list, down from 28 in 2010. A list of the top Pinot Noirs is at www.sfgate.com/cgi-bin/wine/top100-2011/page?id=pinotnoir. Practically every one of the awarded Pinot Noirs was reviewed in The PinotFile this past year and are definitely deserving. Wine Bloggers Not Trusted A report in 2011 from the United Kingdom’s Wine Intelligence Consultancy reported that independent bloggers are one of the least trusted sources of wine information in the United Kingdom, United States and France. The study found that only one in five regular wine drinkers in the United Kingdom trust what independent bloggers say about wine, compared with more than 50 percent who trust their wine merchant. In the United States, the numbers were 20 percent and 80 percent, while only 10 percent of the French trusted bloggers. The report received considerable criticism, especially from many high profile wine blogs The study also indicated that not many people are even aware of wine bloggers. The report ended with the comments that too many wine blogs are poorly written, do not contain the information consumers want and focus too much on the writers of the blogs. Scott Paul Opens Tasting Room and Event Center in Portland Noted Willamette Valley Pinot Noir producer and Burgundy importer Scott Wright has opened Scott Paul PDX in Portland to allow him to host tastings and wine seminars. Upcoming seminars include Burgundy 101, Champagne and Oregon- Burgundy comparison. Phone 503-319-5827 for reservations. Southern Oregon Wine Institute The Southern Oregon Wine Institute (SOWI) was established in 2008 at Umpqua Community College as the first viticulture and enology program in Oregon outside the Willamette Valley. SOWI offers degree, certificate and continuing education programs in a modern 24,000 square-foot, LEED-certified facility that includes a commercial-scale winemaking facility, a private testing facility to serve all regional winemakers, and an event center for conferences, meetings and receptions. The Danny Lang Teaching, Learning and Event Center was recently completed. The center will serve growers and winemakers throughout Douglas, Jackson, Josephine, Lane, Klamath, Coos and Curry counties. For information, visit www.umpqua.edu/viticulture-and-enology. Kendall-Jackson to be Featured on “Undercover Boss” Rick Tigner, President of Kendall- Jackson Winery, will be one of the upcoming bosses to go undercover during the upcoming third season of the reality series, “Undercover Boss.” The episode will air Sunday, January 29, 2012, on CBS. Kendall-Jackson is the first winery to be featured on the show. Chairman and proprietor Barbara Banke, along with her and Jackson’s children Katie, Julia and Christopher, were present for the filming. Music Alters your Drinking Dr. Lorenzo Stafford, a psychologist from the University of Portsmouth conducted an experimental study to find out how music can change the taste of alcohol. Previous research has shown that people drink more alcohol and at a faster rate if loud music is playing in the background. Stafford’s study revealed that sweetness perception of alcohol was significantly higher when music was played in the background compared to other distractions causing a significant effect on taste judgment. The research was published in theJournal of Food Quality and Preference. Vinopedia I found a new online search engine and price comparison vehicle for wine at www.vinopedia.com. The site searches 2,733,185 wine offers. The price lists of wine stores worldwide are compared and background information of each wine such as ratings are included. A locator of wine stores near you is offered as well. I like using it. Dump the Flute for Champagne Every since the vigneron from Dom Perignon visited the Grape Radio studios a couple years back and preferred to drink his Rosé Champagne out of a Burgundy glass, I have retired my Champagne flutes to the back of my glass cabinet, pulling them out only for those who insist on drinking out of them. The latest word according to Georg Riedel (www.thedrinksbusiness.com) is that Champagne houses are openly relinquishing the traditional flutes in favor of white wine glasses. The larger surface area delivers better aromas, complexity and a creamier texture. Flutes are often filled to the top which prevents the wine from breathing. Riedel has developed a new sparkling wine glass similar to a white wine glass that is rounder and larger than a traditional flute. There are many who would argue that the flute is part of the mystique of Champagne and differentiates it from still wine and are reluctant to dump the flute.